The company is recorded in the Post Office Directory of 1915 under the section Disinfecting Powder & Fluid Manufacturers, therefore making this pot post Victorian era. The pot itself is a large pot which would have had a plain ceramic top. Two variations exist in the large size and I believe there are also small size pots available. 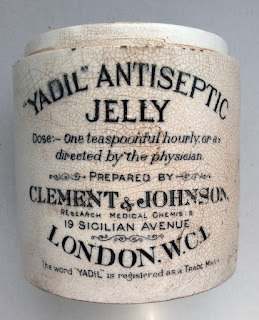 It has the method of use printed on the front, Dose ,- 'One teaspoon hourly or as directed by the physician'. 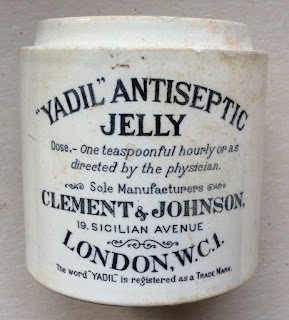 The word "YADIL" is a registered Trade Mark. book produced by Messrs. Houghton & Priestley page 142.